Ziph0n's Official Website - Blog - Tutorial: How to properly use CrashReporter to find the culprit of your crashes? SpringBoard has crashed. There are no suspects. Hate seeing this? CrashReporter is useless, you say. Do you want to find out how to figure out what is crashing your device? Then this tutorial was made for you! CrashReporter is not useless at all. It is a very powerful tool. But, to unleash its power, you need to understand how it works. Firstly (and obviously), you need to download CrashReporter from Cydia. It is available on the BigBoss repository for free. The developer of this tool is Lance Fetters (ashikase). In CrashReporter's main view, you can find all the applications and all the process which have crashed. If it is the first time that you install it, you might not see anything here. However, since iOS itself does log a few crashes, if you've had one very recently, it may appear. 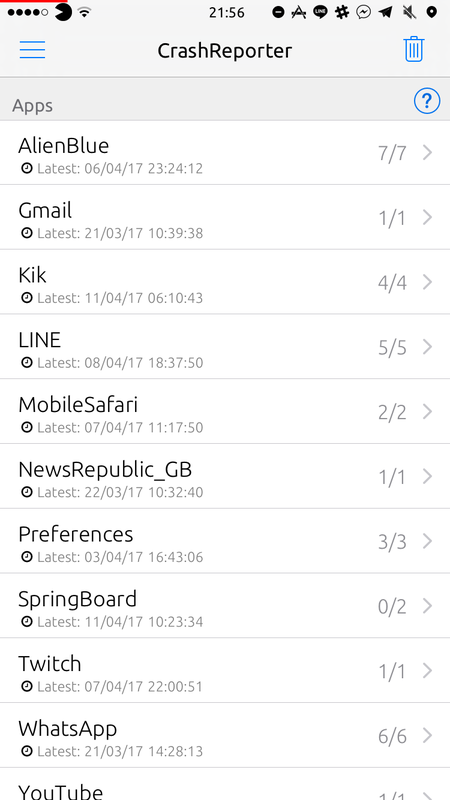 If you tap on an applications listing, you will see all the crash logs for this application. 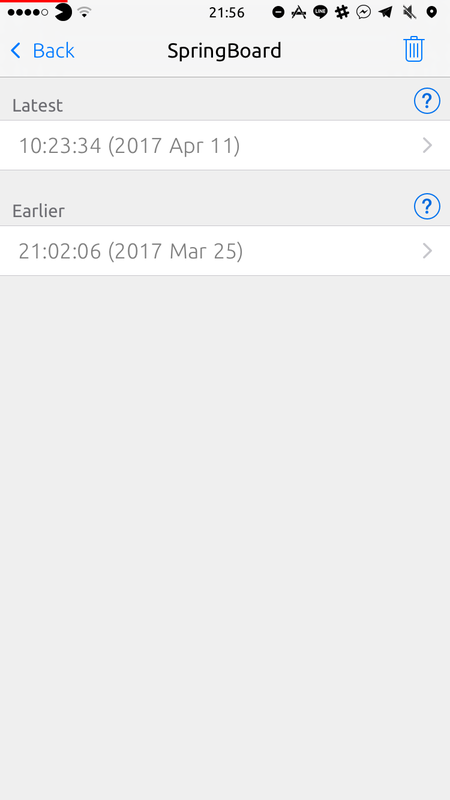 There is the time and the date corresponding to all the crashes. 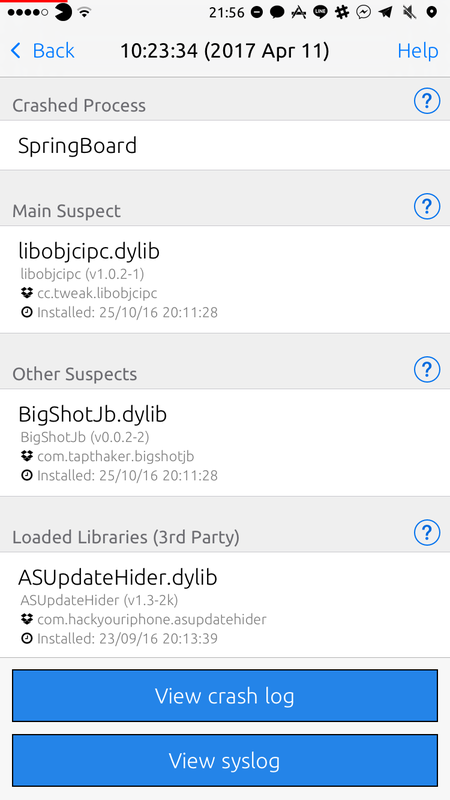 Now, if you tap on a crash, you will see the list of the loaded third-party binaries. But that’s not the most important thing present here. The useful things are the 2 big blue buttons present at the bottom: “View crash log” and ‘View syslog”. The crash log can, sometimes, tell you what tweak is responsible of your SpringBoard crash or your app crash. See further for more information. You can view the syslog of your crash by tapping the second big blue button “View syslog”. The syslog is full of “strange lines”. In fact, the syslog shows you what iOS was doing before the crash. The useful lines will usually be present at the end of the syslog. See further for more information. CrashReporter have detected the suspect of your crash! Cool! You’re lucky! Just delete the suspected tweak in Cydia and the crashing should stop. Your SpringBoard has crashed? But there are no suspects? In this part, we will analyze the crash log to find the culprit of your crash. What do we learn in this crash log? The next lines (between “Thread 0” and “Thread 1” are useful. In our example, there is a “+” before “TypeStatusClient.dylib”. Now, we clearly know that TypeStatus is the responsible of this crash. If the crash log can’t help you, then the syslog can. A bulletin is a notification. So, this line clearly says that the SpringBoard have crashed because of a banner. Here, the culprit was HoverNotifications because it’s not updated for iOS 8.4. Hopefully you can now understand that CrashReporter is a useful tool. I have to admit that some crashes are really weird and sometimes I even myself cannot find the culprit of them. If this happens to you, I suggest you to disable all your tweaks one by one with iCleaner Pro in order to pinpoint the culprit of your crash. If a developer has asked for a crashlog or a syslog from you, here is a nice tutorial by @if0u4d & @freemanrepo: http://tweakcrashed.com/. It explains how to extract the logs and send them to him. Also, if you are still encountering crashes after following this tutorial, I can offer my help. Send the crashlog and the syslog of your crash at ziph0ntweak@gmail.com. I would be happy to help you!